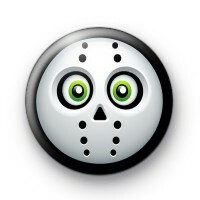 Jason Mask Button Badge inspired by the mask worn by Jason Voorhees, the main character from the Friday the 13th movies. These cute illustration mask badges are so fun at Halloween and look great pinned to your Halloween costume or your school uniform during the Halloween period. We have a massive selection of Halloween badges on the website, so be sure to checkout the rest of the Halloween badge section. Standard 25mm badge made by hand in our family run workshop. These badges are really popular with teachers who hand them out to students at Halloween. We have a great range of witch badges, ghost badges, ghoul badges, monster badges, horror movie badges and pumpkin badges on the website so be sure to stock up this Halloween.